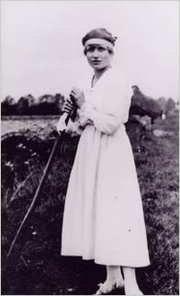 Joanna Cannan was born in Oxford, England to a literary family. Her father Charles Cannan, Dean of Trinity College, ran Oxford University Press for many years. Her older sister May Cannan became a poet and her cousin Gilbert Cannan was a novelist-playwright. Joanna was educated at the Wychwood School and attended finishing school in Paris. During World War I, she served as a volunteer nurse, which was how she met her future husband, Captain Harold "Cappy" Pullein-Thompson, whom she married in 1918. The couple had four children, all of whom grew up to be writers. She began writing after her marriage to help support the family, and published a book every year until she died. Her work falls into two main categories: novels for adults such as The Misty Valley (1922) and detective fiction, such as Murder Included (1950); and fiction for children. She established the pony book genre aimed mostly at girls, beginning with A Pony for Jean (1936), which was eventually continued and enlarged by her daughters Josephine Pullein-Thompson, Diana Pullein-Thompson (Farr), and Christine Pullein-Thompson (Keir). Joanna Cannan is currently considered a "single author." If one or more works are by a distinct, homonymous authors, go ahead and split the author. Joanna Cannan is composed of 3 names. You can examine and separate out names.